We are interested in negative regulatory circuits which involve the induction of proteins of the family of suppressors of cytokine signaling (SOCS). SOCS proteins have been shown to inhibit cytokine signal transduction via the JAK/STAT pathway. We were able to show that also Toll-like receptor (TLR) dependent microbial stimuli are able to induce members of the SOCS family. This is an important restriction point in the temporo-spatial regulation of inflammatory processes. 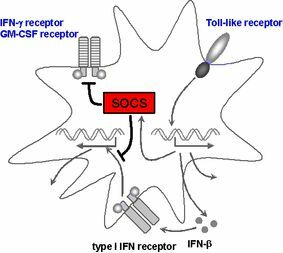 Moreover microbial stimuli can interfere with differentiation of dendritic cells through induction of SOCS1. Furthermore we have shown that intracellular microbes can exploit SOCS proteins for improvement of their own survival. We were the first to identify a previously unknown nuclear localization signal in SOCS1 which mediates nuclear transport of this protein. A newly discovered function of nuclear SOCS1 is regulation of NFkB p65 stability and activity through ubiquitination and proteasomal degradation. A recently developed mouse model that lacks nuclear translocation of SOCS1 indicates a role of nuclear SOCS1 for regulation of airway epithelial cells and Th2 inflammation in the lung.